Every time I go to Mexico City, I try to schedule a weekend stopover so I can get to the Bazaar del Sabado in San Angel. 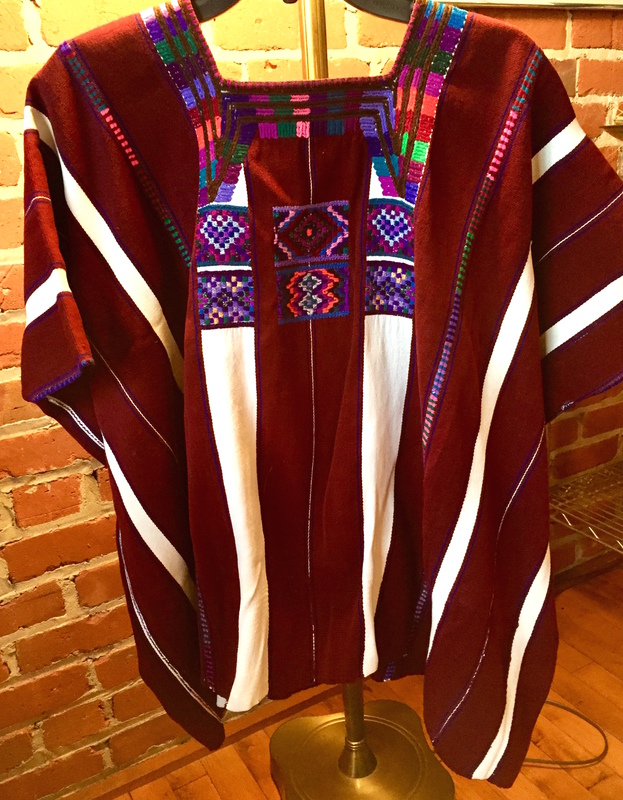 It’s there that I find contemporary and indigenous clothing, vintage collectibles, street vendors selling wares from all over Mexico, and the up-and-coming brand Takamura 1/8 from Mexico fashion designer Guillermo Vargas. Vargas will be in Oaxaca this Friday, 9 a.m. to 7 p.m., and Saturday, 10 a.m. to 8 p.m., only for a pop-up show/sale in collaboration with/at Colectivo 1050 Grados at the Plazuela Cruz de la Piedra on upper Garcia Virgil near the acqueduct. Remember where El Quinque used to be? This is the neighborhood. I plan to be there on Friday morning. 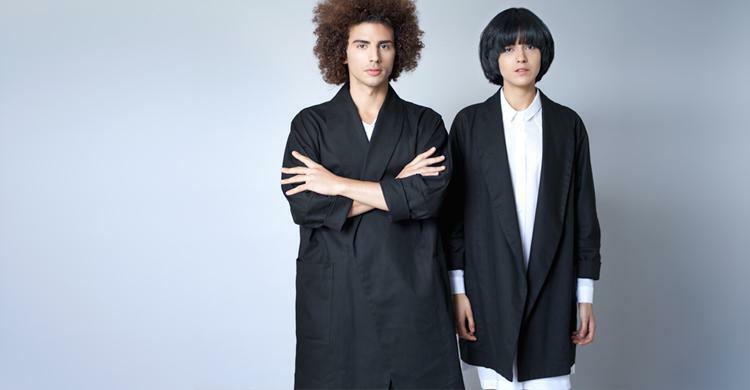 What I love about these clothes is their easy flow, Japanese and indigenous influences, abstract/asymmetrical design, innovation and comfort. Note that I say influences — not copied! Fabrics are highest quality. Seams are well-finished. Garments fit and wear beautifully. 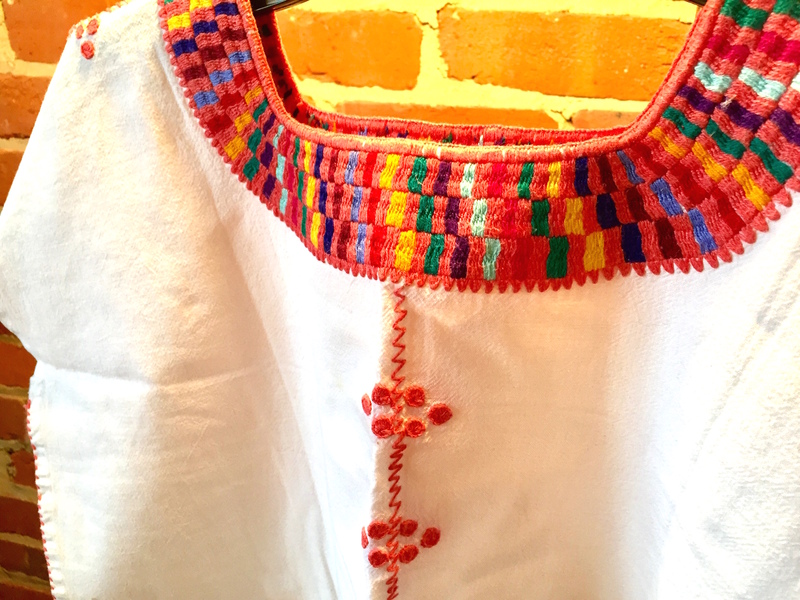 Each time I visit Mexico City, I seem to walk away with a shirt or a dress that works either here in Oaxaca, in Mexico City or in the USA. 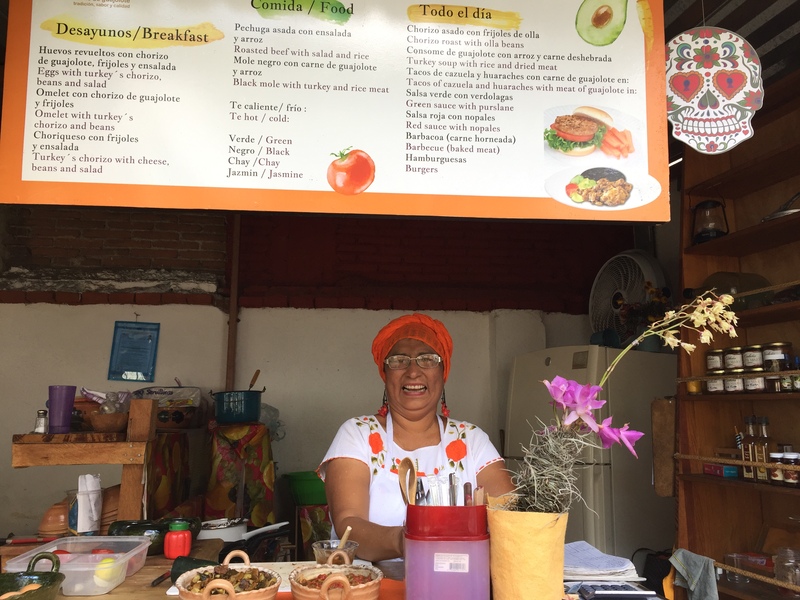 La belleza de la tradición & la innovación se unen en Oaxaca. Colectivo 1050° es una marca de objetos de barro, hechos a mano en Oaxaca por talentosos artesanos. 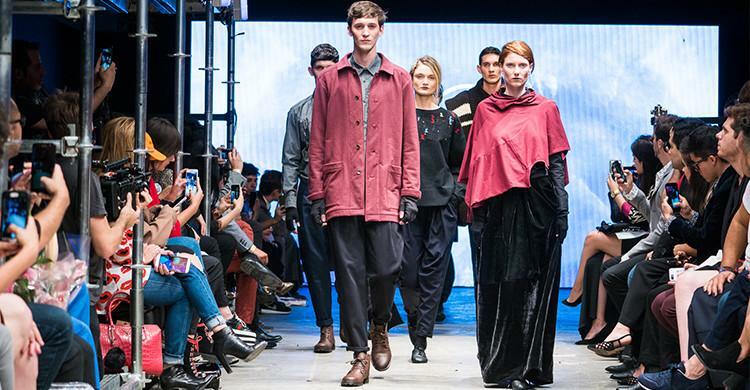 Los diseños son creados en colectivo, e integran la sabiduría de la tradición con el dinamismo de la innovación. En 1/8 Takamura busca responder a las necesidades de la indumentaria contemporánea con piezas generadas a partir de criterios estéticos y funcionales. 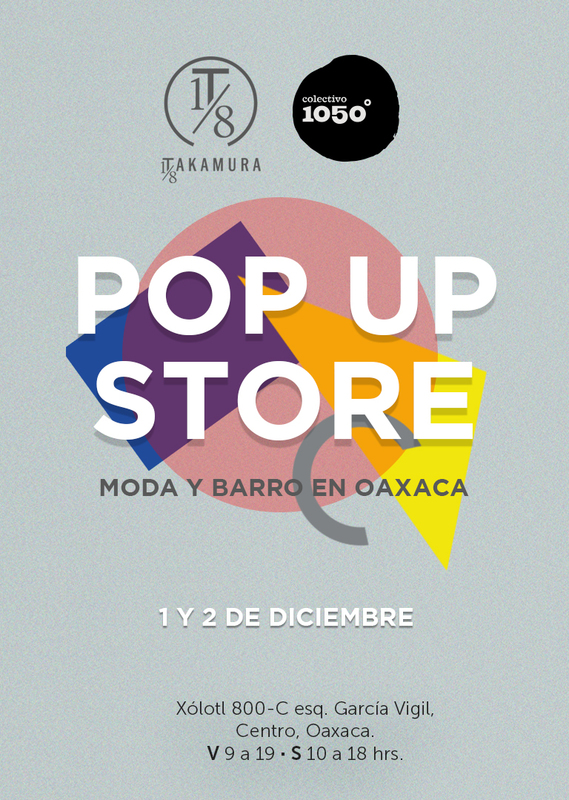 En está ocasión Colectivo 1050° acoge a 1/8 Takamura para un Pop Up Store; tradición, moda y estética en un mismo espacio. 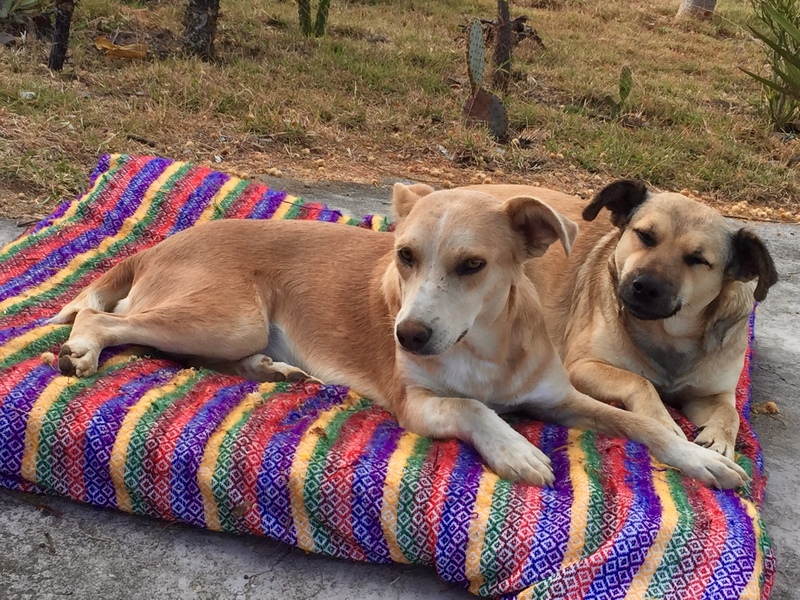 Adopted Campo Dogs at the Casita, Teotitlan del Valle, Oaxaca, Mexico: Where are they now? 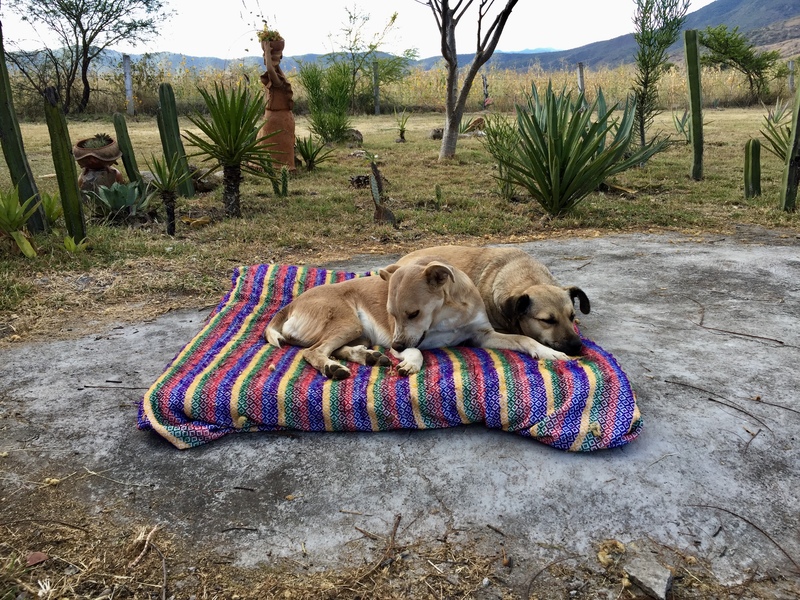 This is a five-month saga that began at the end of June 2017, when a homeless field dog gave birth to two puppies in the tall grass behind my casita in Teotitlan del Valle. The pups, both females, were the size of my fist. I’m little. Let me first say: I have never owned a dog before …. ….except for the time a boyfriend gave me one for a birthday present and my mom promptly gave him away, and then another time, as a young mother, when I took in an Irish setter who, after having been chained for a year, escaped out the front door and was instantly killed by a car. I swore never again. And, I didn’t, until now. Tia on the left, Mamacita on the right. Bed a gift of Sylvia. 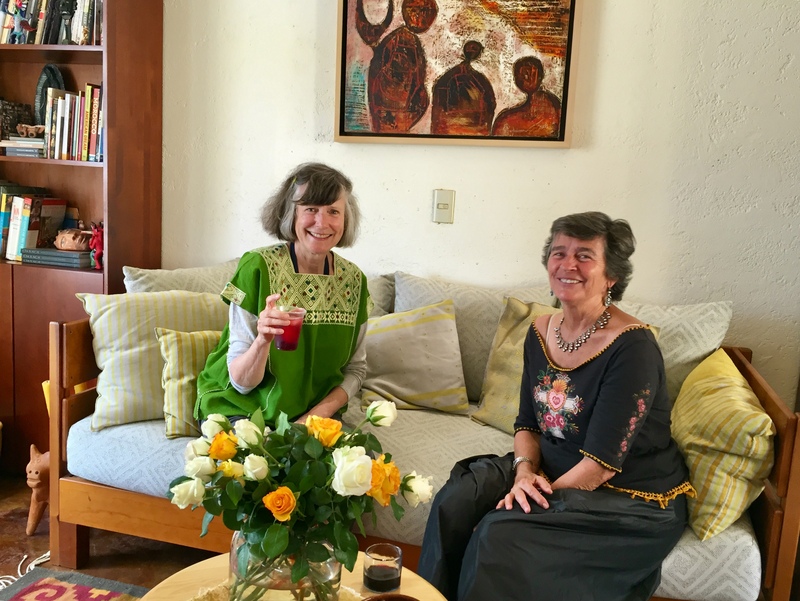 In the intervening months, first Sylvia Johnson Feldman and then Kalisa Wells came to stay and care for the dogs. Then, a female dog with a strong resemblance to Mama (I named her Mamacita) showed up. Sylvia says this young female was always there in the background. We didn’t know the relationship so we called her Tia. She joined the family and offered auntie services to acculturate the babies. Natural tranquilizer, Gil Shaham’s violin! Count: FOUR dogs at the casita. 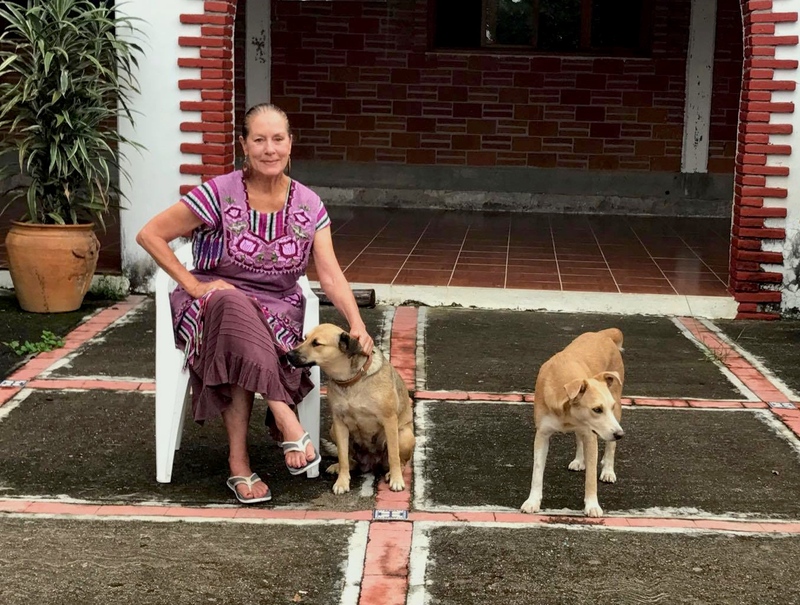 Sylvia took charge of adopting out the two original pups, Luz y Sombra at ten weeks to great Zapotec homes. They had their puppy shots and a clean bill of health. The new owners promised to spay them. Sylvia went back home to the USA and Kalisa arrived from San Diego to take over. Count: TWO dogs at the casita. The Foundlings playing with Tres por Diez towel. Thank you Kalisa. Kalisa was walking the dogs daily down to the nearby river. 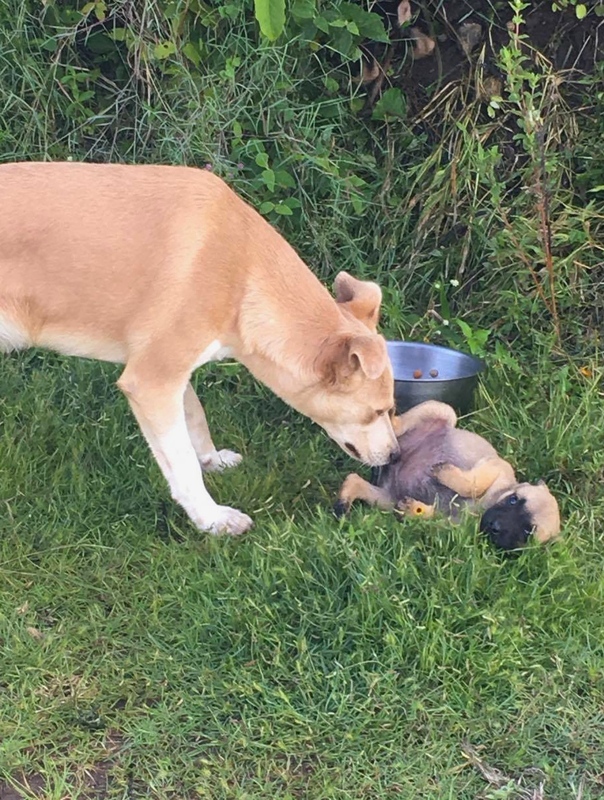 One day she came upon two abandoned female puppies. She called them her Foundlings. 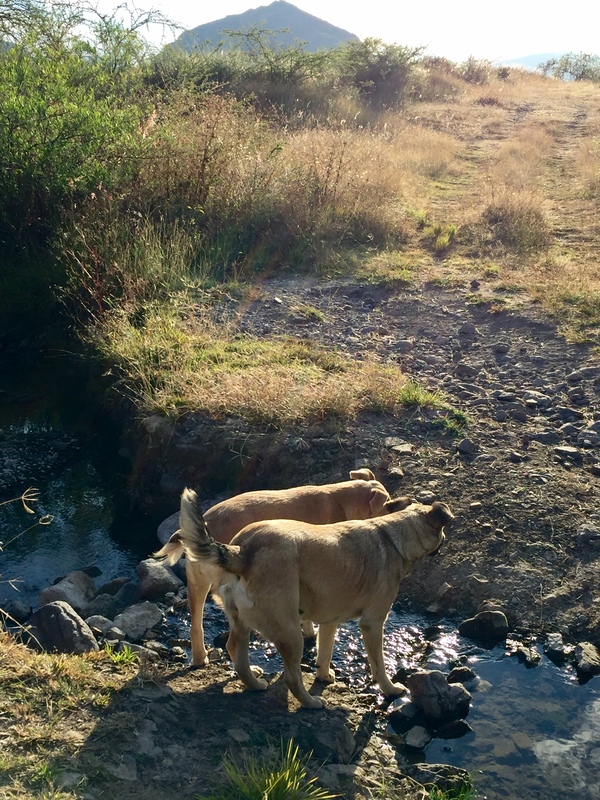 First, she fed them at the river and then, of course, they followed her home. Tia nuzzling a Foundling; mother surrogate. Just old enough for wet food. We thought we could adopt out Tia, who was a young, beautiful teenager. Kalisa at the Spay/Neuter Clinic waiting their turn. 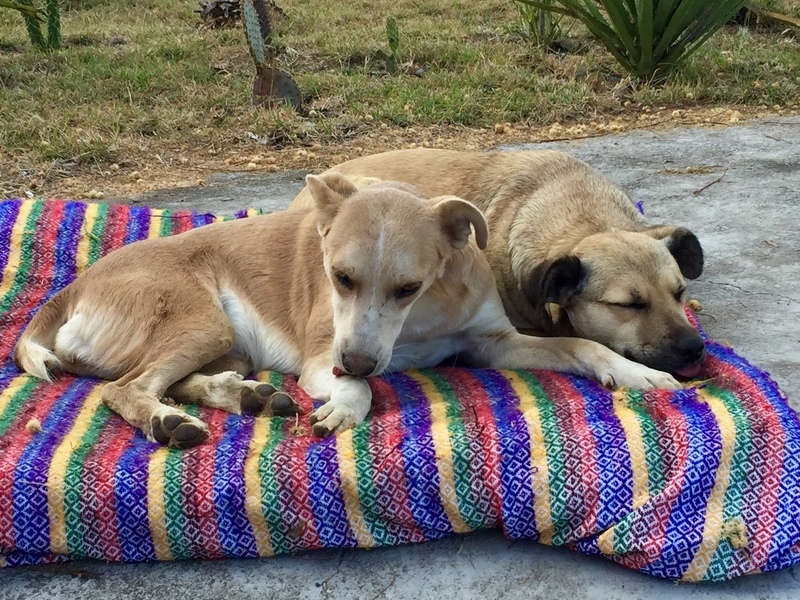 With the guidance of Merry Foss’ Teotitlan del Valle spay and neuter clinic, Mamacita and Tia were spayed by Veterinarian La Doctora Alma from nearby Tlacolula de Matamoros. 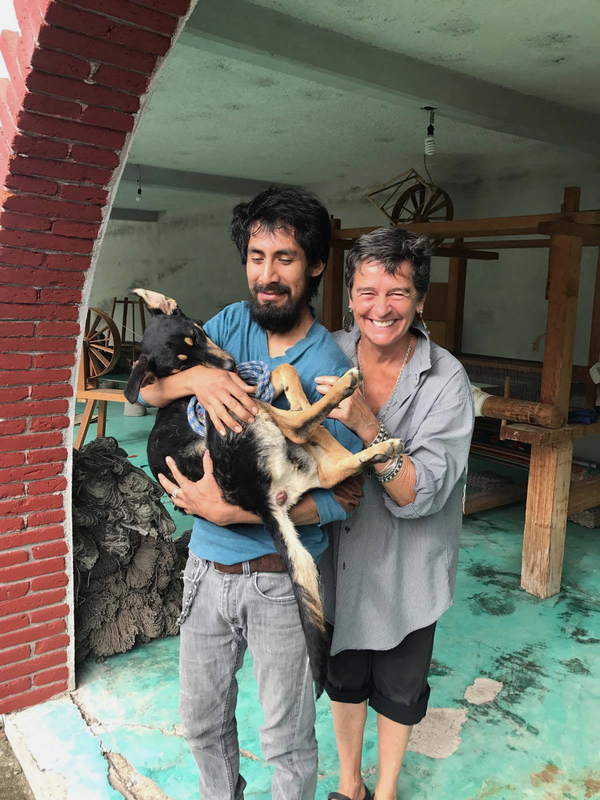 The cost was 200 pesos (about $12 USD) per dog to cover the cost of medication and surgery. They recovered. 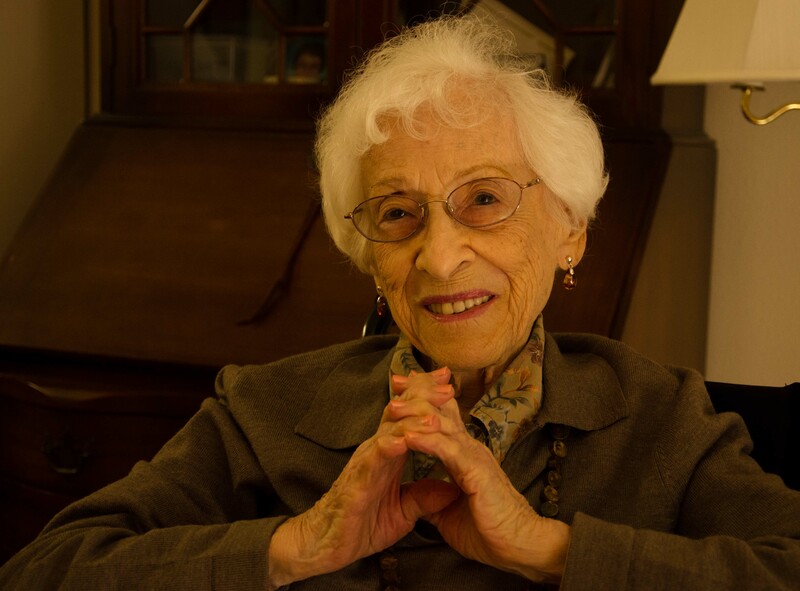 Merry is our hero. We call her Maria de los Angeles de Perros. Note: The village President opens his house for the clinic. He doesn’t want any more dogs poisoned, shot or abandoned. One day, one of the Foundlings came home with a kitten in her mouth. Count: FOUR dogs and ONE cat. Our friend Arnulfo adopted one of the Foundlings with the promise of a free spay when when she was old enough. 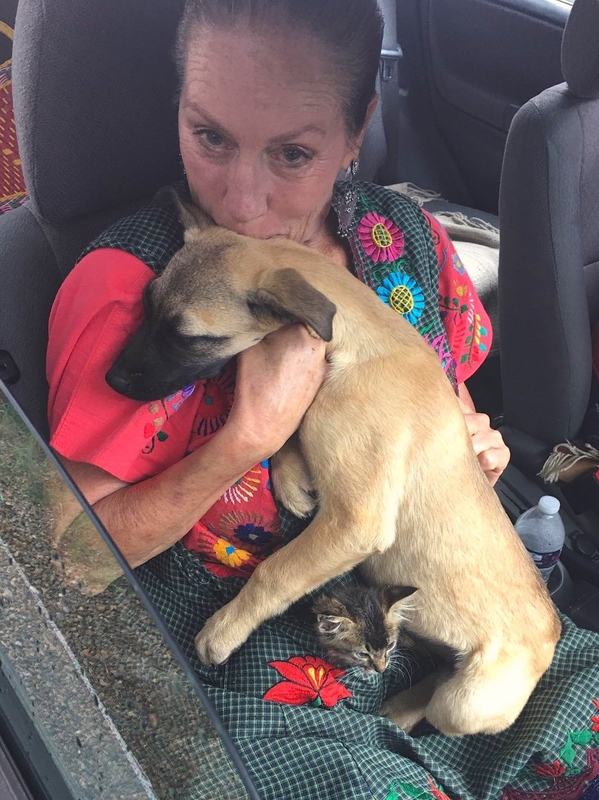 At this point, Kalisa and Merry cajoled La Doctora Alma into finding a home for the remaining Foundling and one kitten. By now, Foundling was almost too big to carry in a woven market basket. The kitten fit nicely into the pocket of Kalisa’s apron. All was calm for a while, except for after midnight barking and yowling on the patio. I returned just before Thanksgiving. 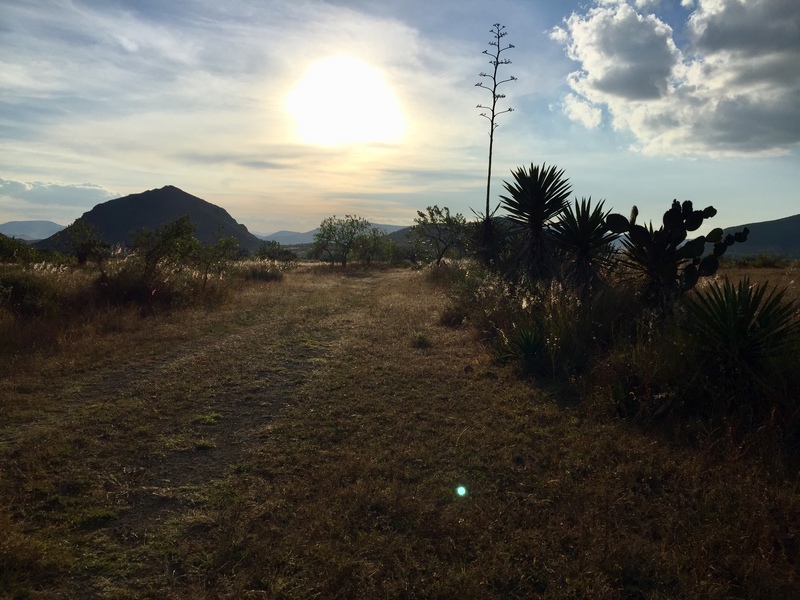 Out for our daily walk, back road to Macuilxochitl. Count: TWO dogs, Mamacita and Tia. Mamacita recognized me immediately, even though I was absent for almost four months! Tia, who I want to rename Nelly (as in Nervous Nelly) was VERY stand-offish but is getting used to me. She is Kali’s dog! Taking a break at the stream. Now, I want you to understand, these are SURVIVAL dogs. 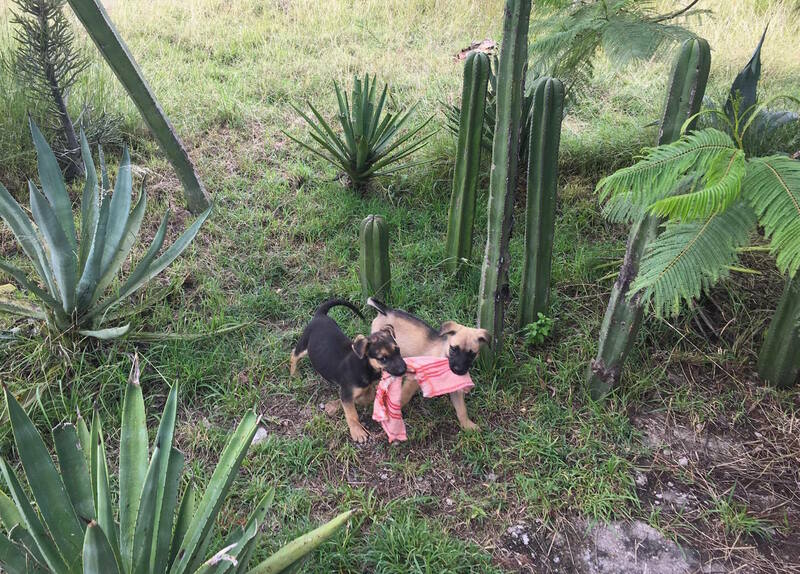 They may have been born in the campo (field) or discarded as unwanted female puppies (no one here wants a pregnant dog) to live or die on their own. Merry Foss says she has spayed/neutered almost 400 dogs and cats since she started the clinic a few years ago. Now she has the help of the pueblo president to promote responsible dog ownership. Villagers consider their animals as GUARD dogs, not pets, for the most part. They are MUTTS that roam the streets and fields in search of food and shelter. We see very few purebreds here. Yet, they are both now eating out of my hand! Our dogs are nocturnal day sleepers and have the opposite sleeping patterns from me. To get up several times a night to let them in and out of the patio when they bark and howl is not what I bargained for! Please forgive me. So, last night their bed went into the carport and I got a complete night’s sleep with ear plugs and the white noise of my fan. I think we are going to make it! Macuil’s sacred mountain. Zapotec villages have shrines atop them. I bet you thought I disappeared! 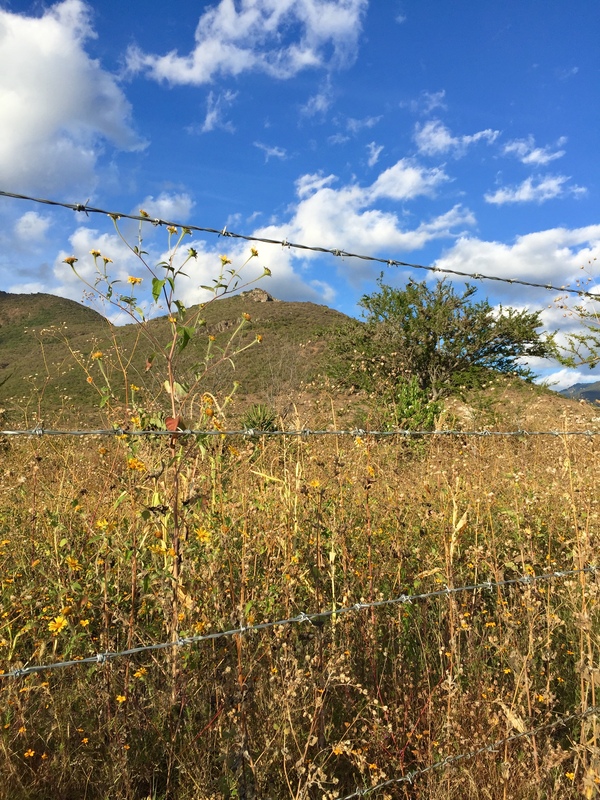 This is my first post since returning to Teotitlan de Valle, Oaxaca, a week ago. I came back to my casita filled with aromas created by professional cook Kalisa Wells, who has been house sitting my two adopted street dogs. All kitchen surfaces were covered with culinary ingredients. It was a sight to behold. And, then, Thanksgiving was a mere four days later. Cuni Cuni Guajalote. Yummy Yummy. 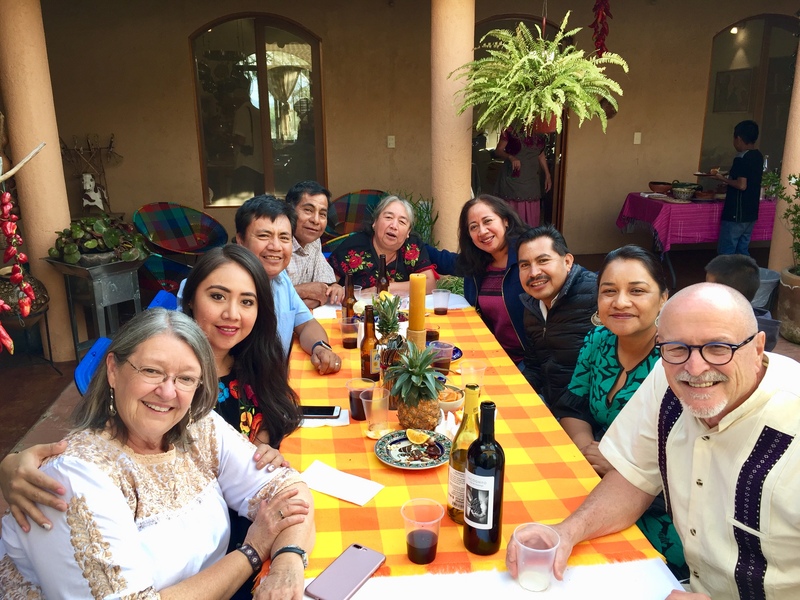 From Durham, North Carolina and via Facebook, I ordered organic turkey raised in the Mixteca region of Oaxaca from Cuni Cuni Guajalote before I left. 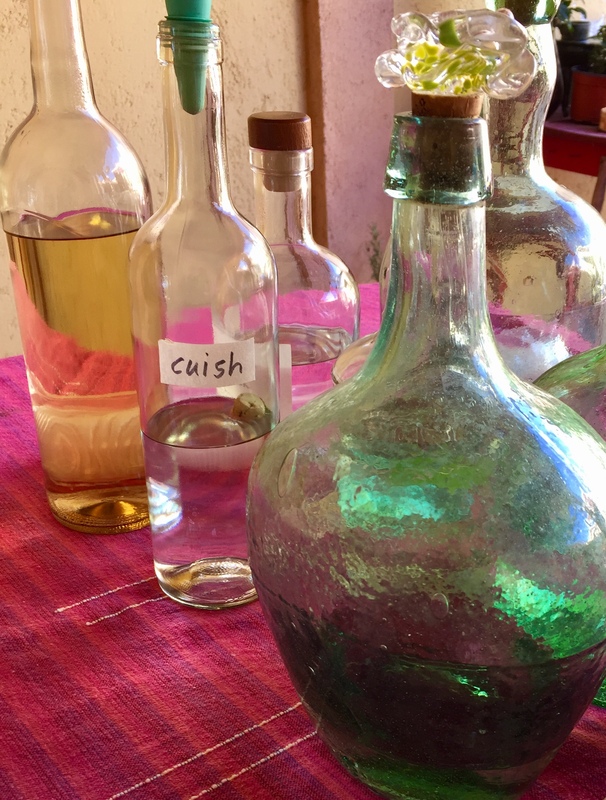 This took some sleuthing, hunting down their whereabouts via the Facebook group Clandestine Oaxaca Appreciation Society — the source for everything Oaxaca. 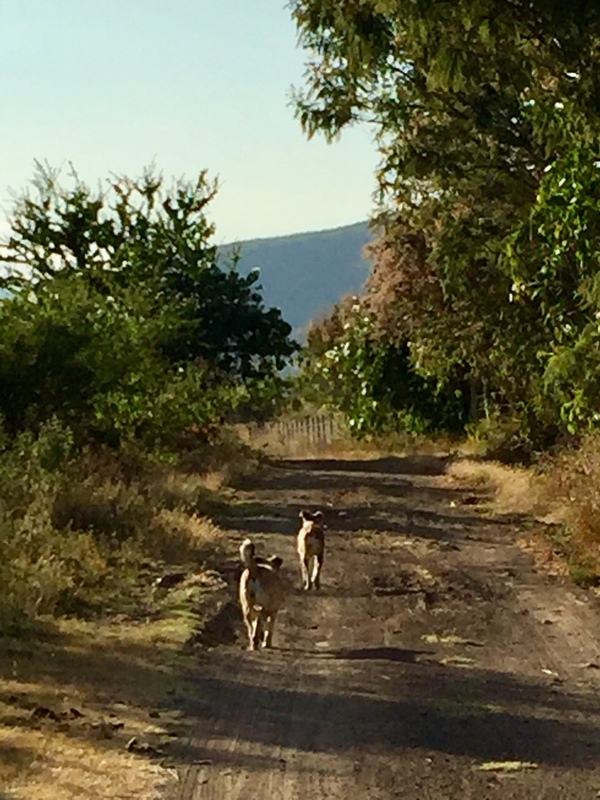 As it turns out, we decided on two smaller birds instead of a 9 kilo (20 pounder) when we did the pick up at La Cosecha organic market at Macedonio Alcala #806 — enough to feed a crowd that kept expanding beyond local family and intimate friends as I settled back in to village life. We were worried about one big turkey fitting into a basic gas oven. It was the roasting pan and rack that had us stymied. Neither of us brought a sturdy vessel or rack from the USA and the only thing we could find were flimsy aluminum, so we bought three and stacked them. There were no racks to be found as I cruised the aisles of the super mercado. My eyes lit on a stainless steel dish drainer. Sure, it had those upright racks to hold the dishes vertical and immovable tall sides. I bet my friend Arnulfo and I could figure out a way to modify this, I said to myself. Into the cart it went. And, here’s how it turned out. 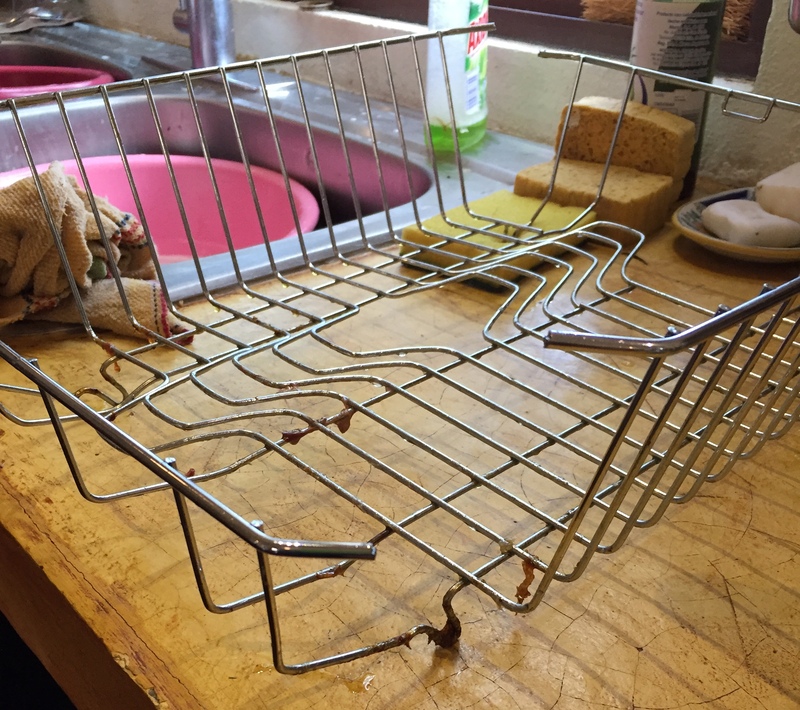 Flattened, cut dish drainer. Be sure to remove plastic feet! One of the great pleasures of being in Mexico is that we learn to innovate, modify, imagine and manifest. Things we need don’t always come easily, but there seems to be a way to improvise and make it work. I have learned this from my Mexican friends who are masters at adaptation. And, if you live in Oaxaca, I encourage you to think about ordering your Christmas turkey from Cuni Cuni Guajalote. You will love it. Expensive? Yes. Worth it? Yes. This is NOT your Sam’s Club or Walmart frozen commercial turkey. How we roasted the turkey! Kalisa loves butter. I found the local dairy-cheese man from the Teotitlan del Valle market and bought up all the butter he had. Probably five pounds. Kali coated the turkeys in butter, stuffed them with oranges, rosemary, apple peels (no pits), celery and carrot ends, covered the turkey with foil and put it into a hot 450F degree oven for about 20 minutes. Then she lowered the heat to 350 degrees Fahrenheit and continued to roast covered at 18 minutes per pound until the drumsticks wiggled easily and the juices ran clear. We didn’t have a meat thermometer. 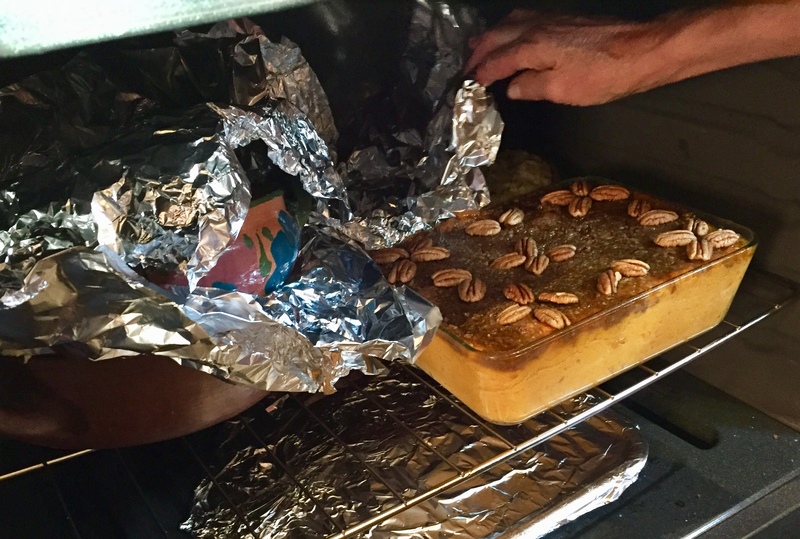 We were also cooking at 6,000 feet altitude using an oven with Centigrade settings, so we converted everything. We needed this conversion for the camote and apple pies, too. But had to jack up the heat because we are running off a propane tank at a higher altitude. So, it was check, check again, triple check. NOTE: We did not stuff the turkey because this is the most common culprit for botulism. 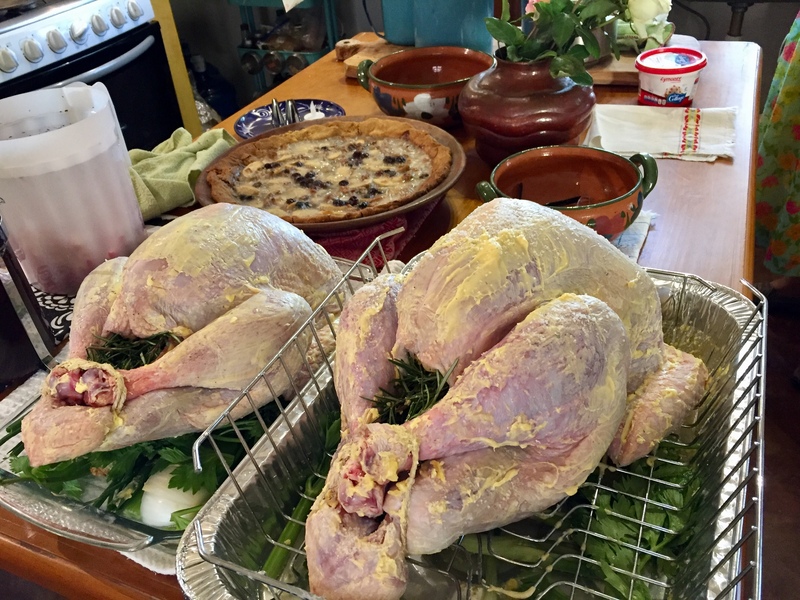 The turkey must be completely thawed and at room temperature to be stuffed and cooked successfully without risk of infection. Many people stuff a partially thawed turkey (oh, it’s just a little cold in there, it’s okay) and the inside becomes an incubator for the bacteria. 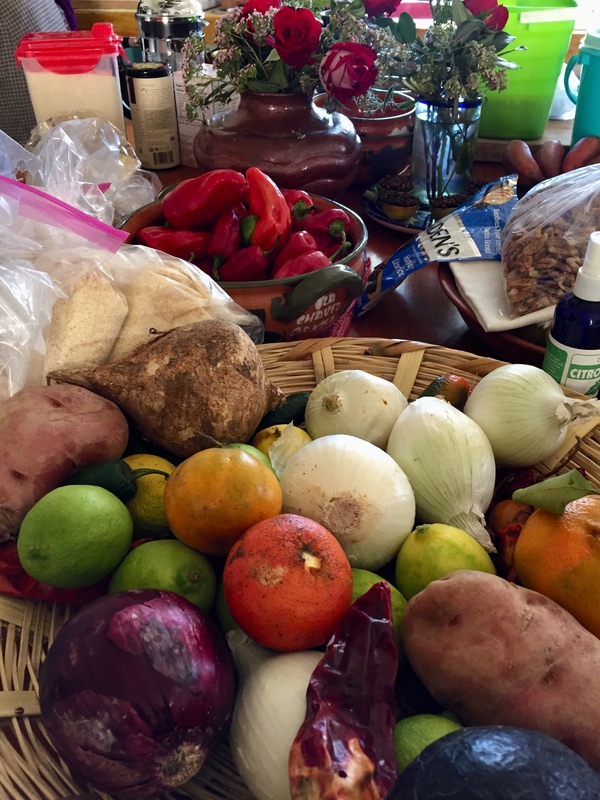 Everyone who came brought something to contribute: mashed potatoes, cranberries, Boulanc rolls, salad, organic black beans, tortillas made with local field corn, chocolate, wine, beer, mezcal. Yes, I smuggled fresh cranberries from Whole Foods but Jacki found them locally. 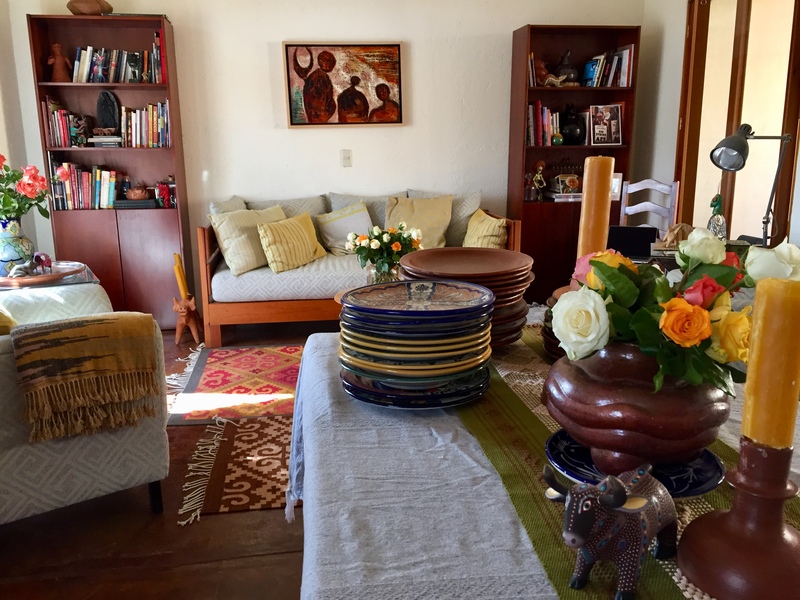 Setting the table, Teotitlan del Valle. 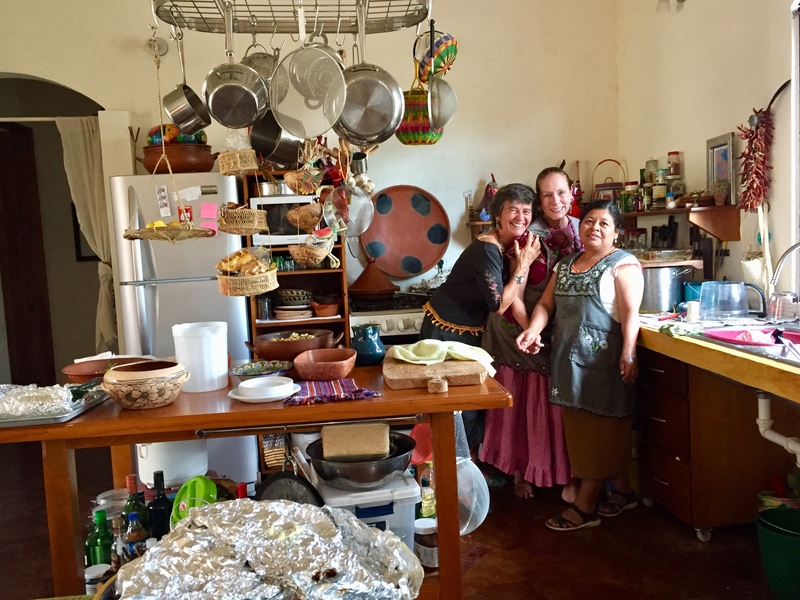 Earlier in the week, Kali and I made a visit to Macrina Mateo Martinez in San Marcos Tlapazola to get large platters that would serve as pie pans and some extra dinner plates. 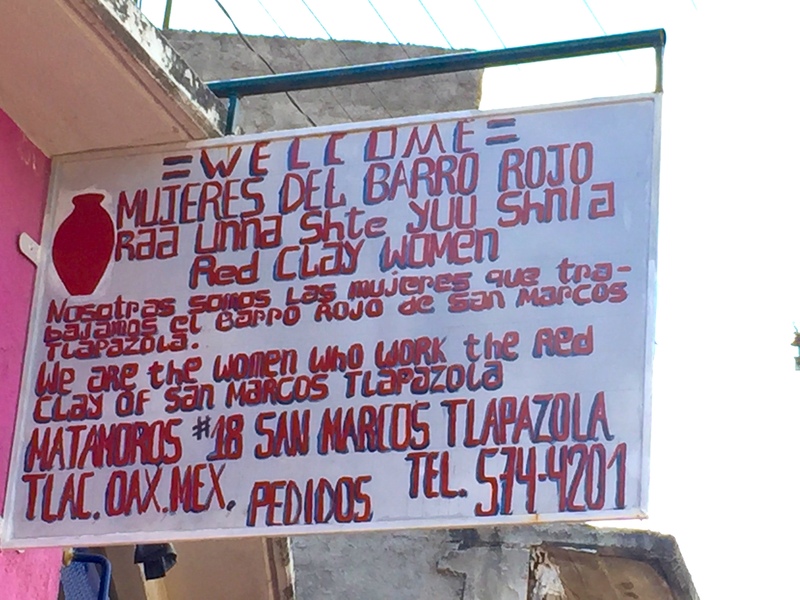 They are my go-to family women’s cooperative for fine barro rojo that those of us who live here love to use. I’m very happy to be back in the village, surrounded by mountains, warmed by the sun, a hammock on my rooftop handwoven by the daughter-in-law of Mitla’s Arturo Hernandez. Despite the barking dogs and crawling critters, I am now embracing a slower pace of life — for the moment. Tours and workshops start up in mid-December! I’m Mexico bound next Thursday, November 16, 2017, and this is the last of my collection I will offer for sale now. Stay tuned for when I return in March 2018. These are all one-of-a-kind pieces I’ve collected over the years, most of them new. I buy to support the artisans I visit and send these lovelies on to you. Scroll down. 4 SOLD. 3 Available. How to Purchase? Send an email to me, Norma Schafer. Tell me the piece — by number — that you want to buy. Also include your mailing address. I will send you a link to make a PayPal payment that will include the cost of mailing via USPS. If you are in Canada, it will be sent international First Class. Thank you. Please order by Monday, November 13. That will give me time to package and get to the post office before I leave! 1. 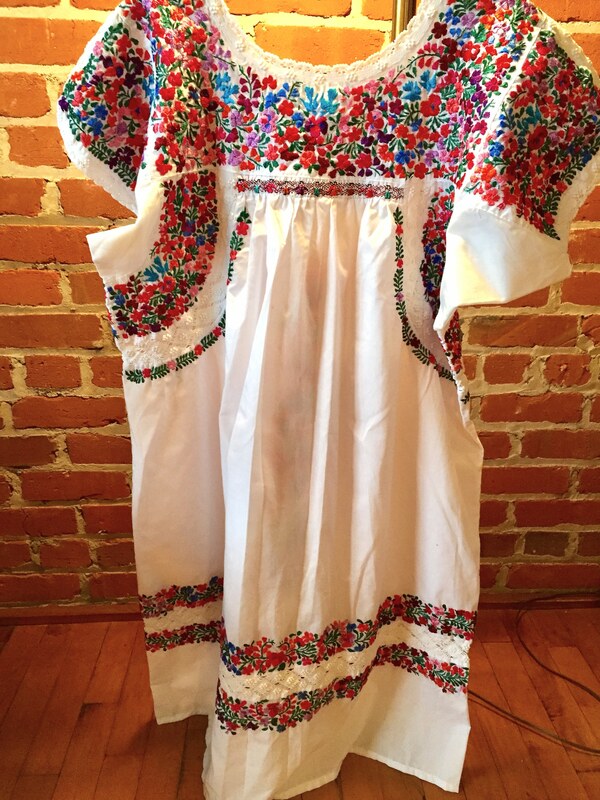 This is a full-length Oaxaca Wedding Dress, $260 USD. 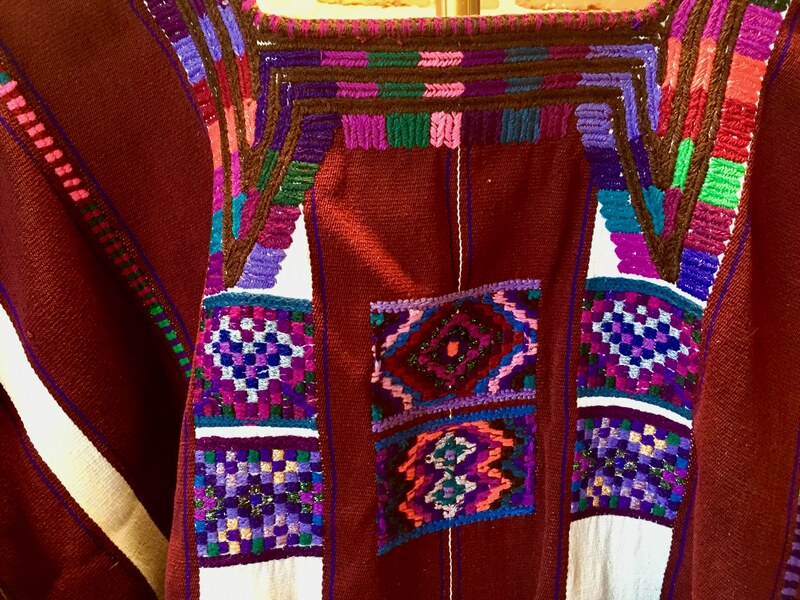 Even in Oaxaca, embroidery and crochet of this quality can sell for $400 USD or more. Examine the detail of the little dolls at the neckline that serve as bodice gathers. 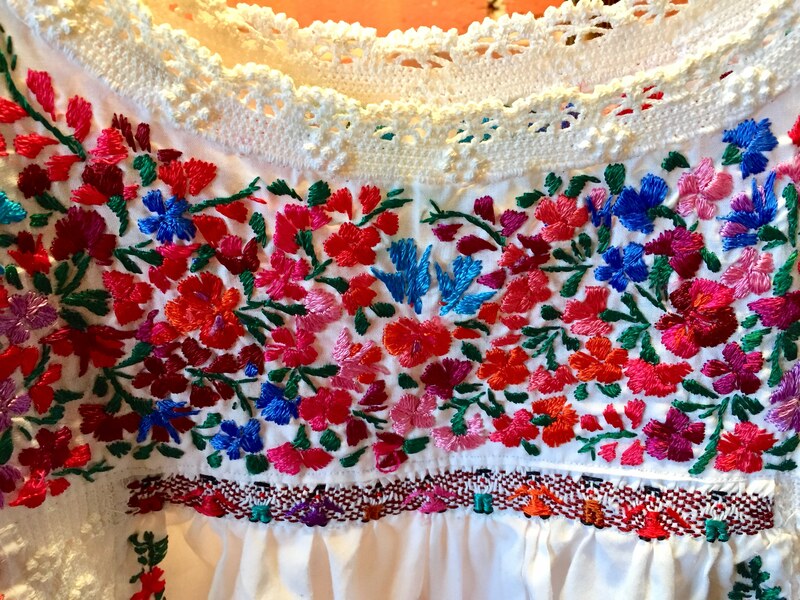 Look at the intricacy of the crochet work and embroidery. This is a very fine piece! 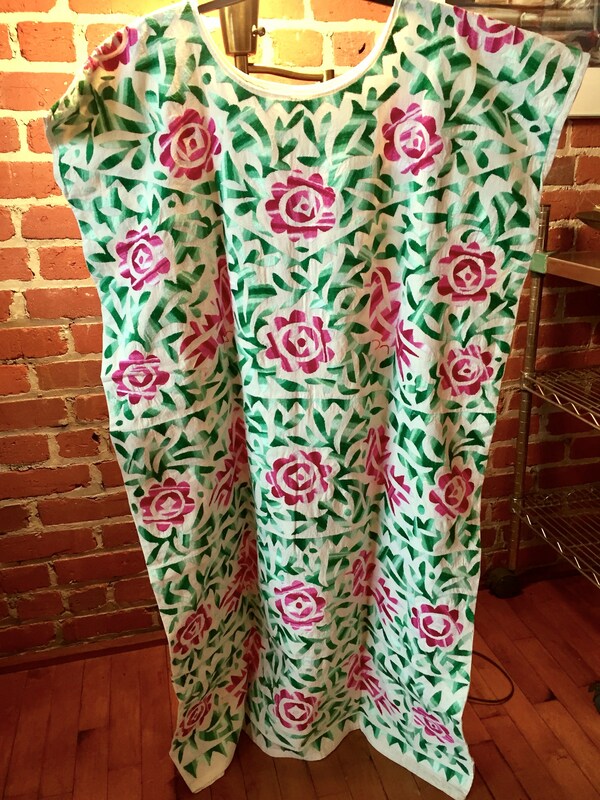 Fabric is a cotton-poly blend. Size Large-XL. 1. 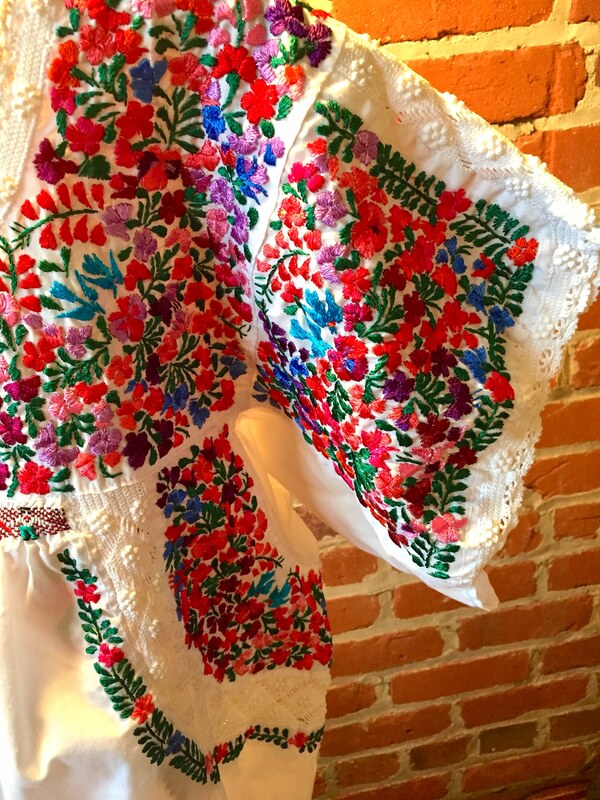 Sleeve detail, Oaxaca wedding dress. 2. 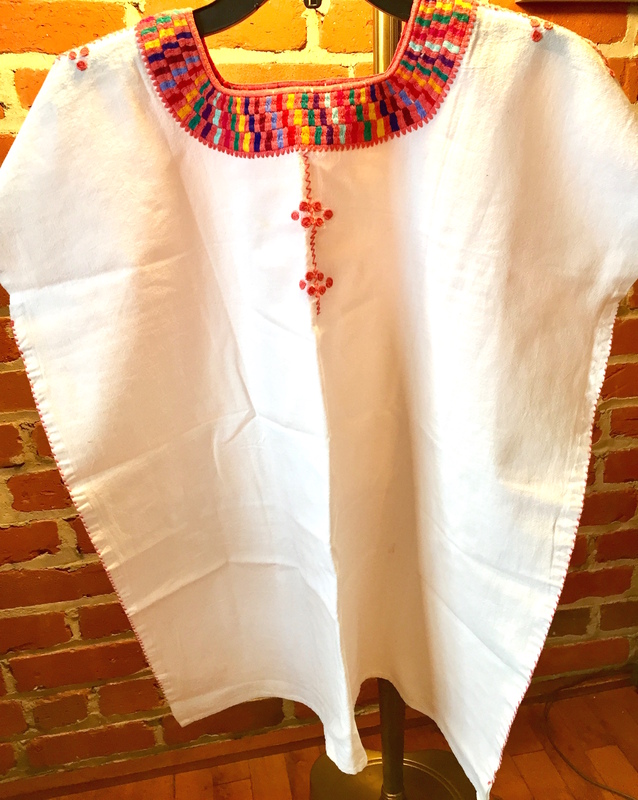 This hand embroidered floral motif dress is from the remote village San Miguel Soyaltepec — an island in the Miguel Aleman Reservoir, State of Oaxaca. I bought this piece there and never wore it. $235 USD. 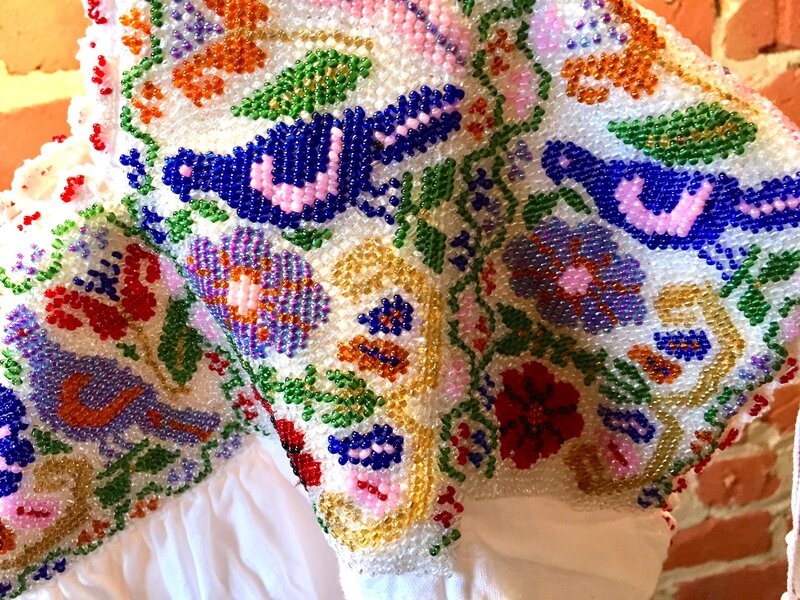 The stitches are teeny-weeny, dense and beautiful. Size L-XL. 3. SOLD. 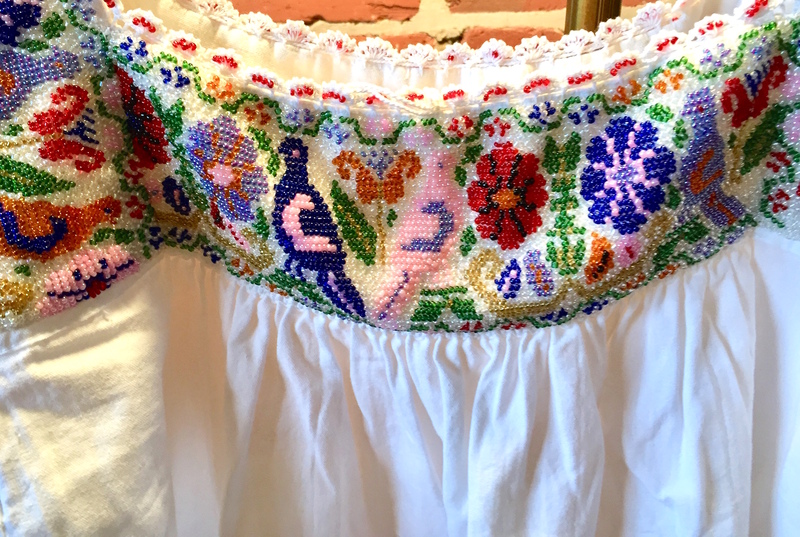 Birds, flowers and vines are beaded onto the bodice of this beautiful China Poblana blouse from the mountains of Puebla, about 6 hours from Mexico City. 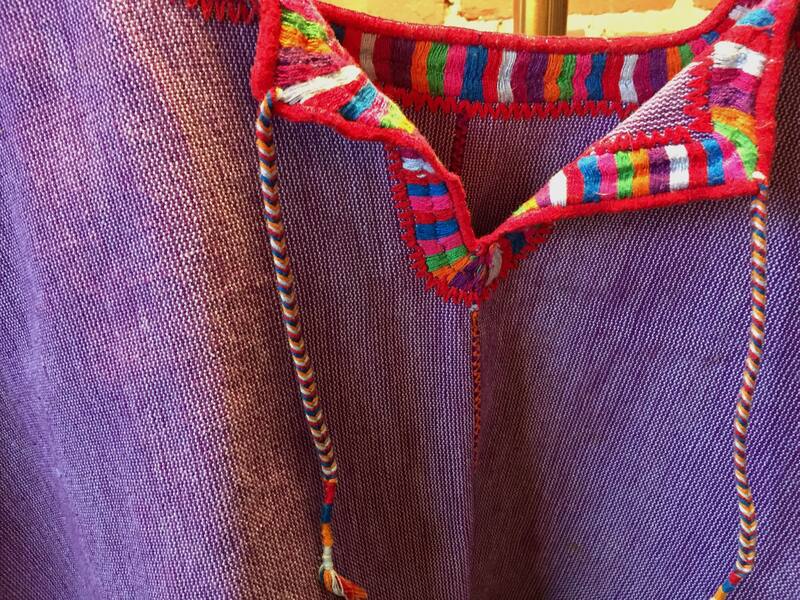 The neckline and sleeves have a drawstring to loosen or tighten. The background is entirely filled with translucent clear beads. $135 USD. Size L-XL. 4. SOLD. 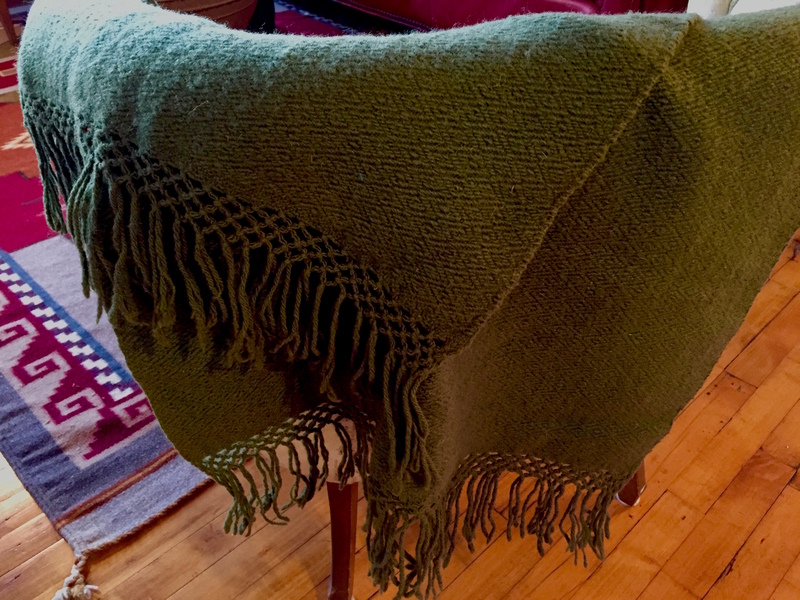 This 100% wool shawl measures 76″ long and 20″ wide, and is hand-woven on a pedal loom in Teotitlan del Valle by Juan Carlos, an very accomplished artisan. It is dyed with pericone/wild marigold with an indigo over-dye. $125 USD. 6. SOLD. 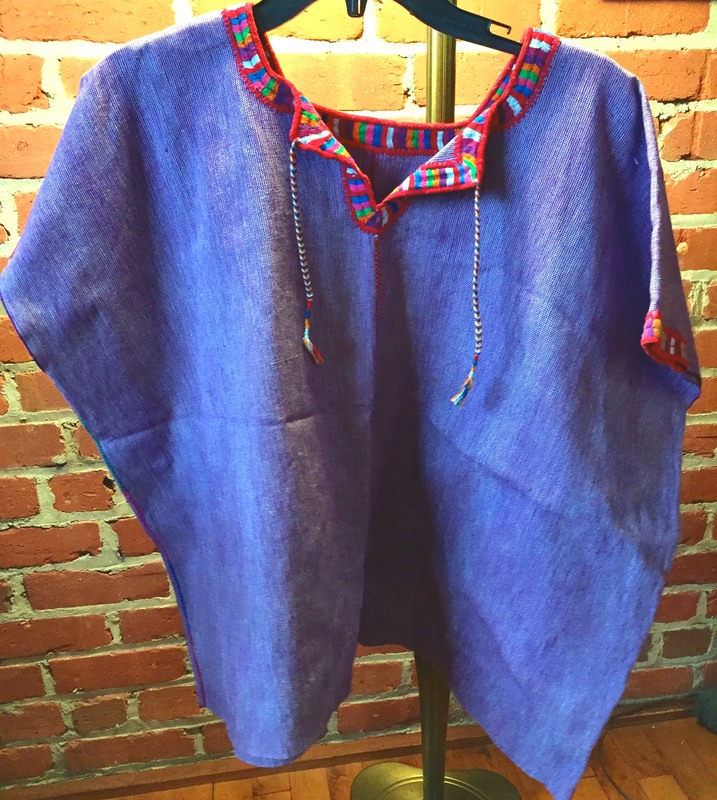 Lavender blue blouse with rainbow neckline and sleeve embroidery. $65 USD. 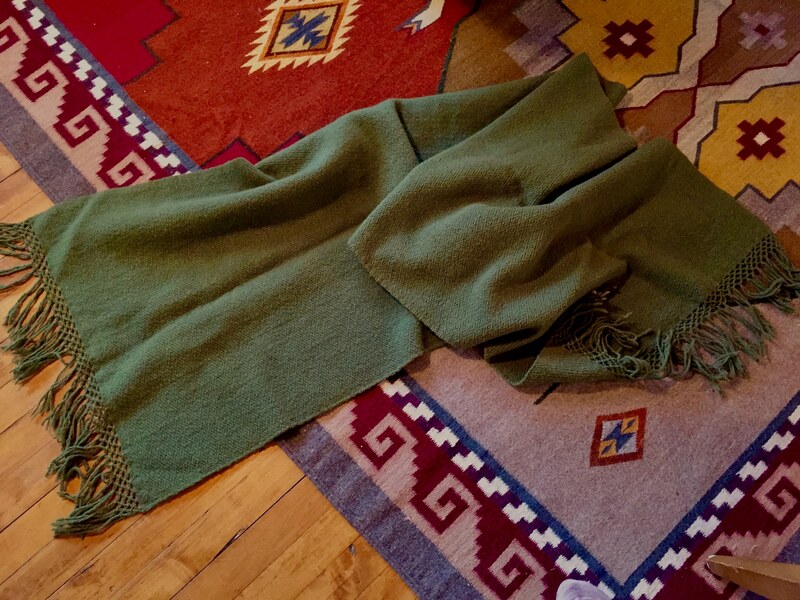 Textile is hand-loomed and hand-embroidered, very soft and sturdy. Size L-XL. 7. SOLD. 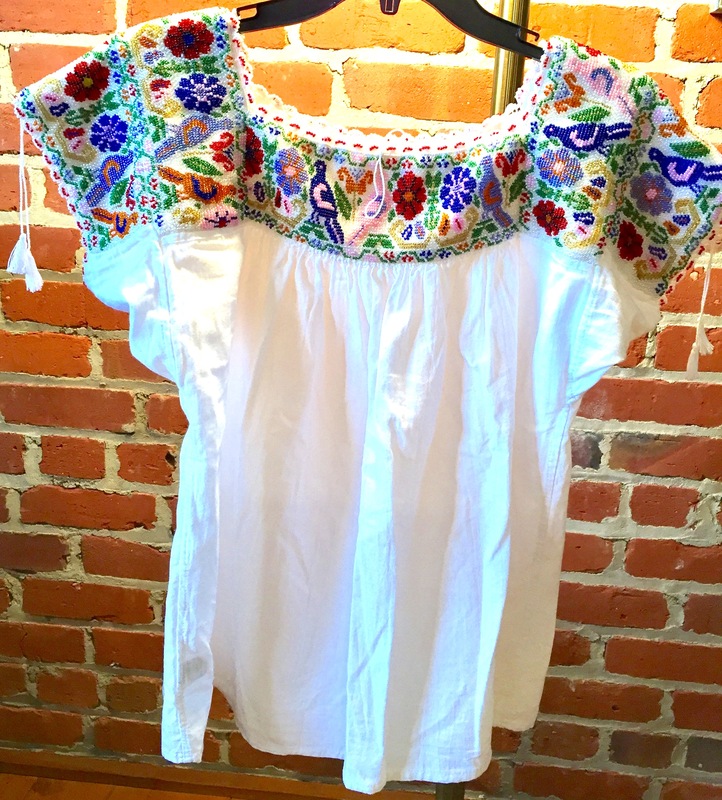 This simple blouse has an attention-grabber neckline, with little embroidered details on the shoulder and down the front. Hand-embroidered on commercial cloth. $35 USD. Size L-XL. In 1976, a few years before I opened a gourmet cookware shop and cooking school in South Bend, Indiana, I contributed a recipe to the first edition of the Temple Beth El cookbook. 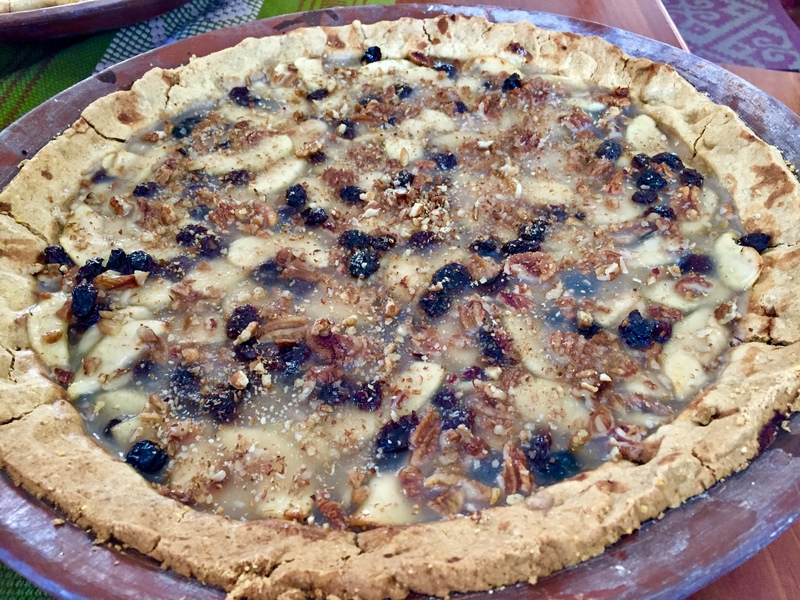 Mama Dorothy’s Apple Pie is based on one that my mother prepared on occasion. For Dia de los Muertos, I found myself consulting that cookbook yet again as I prepared to welcome her spirit back to me. I love this corn meal crust because of it’s crunch. I buy Goya brand extra coarse corn meal from the Mexican market. The egg yolk enriches the crust and binds it together. Pulse to stir these dry ingredients together. Add egg yolk and distribute the butter pieces evenly atop the flour mixture. 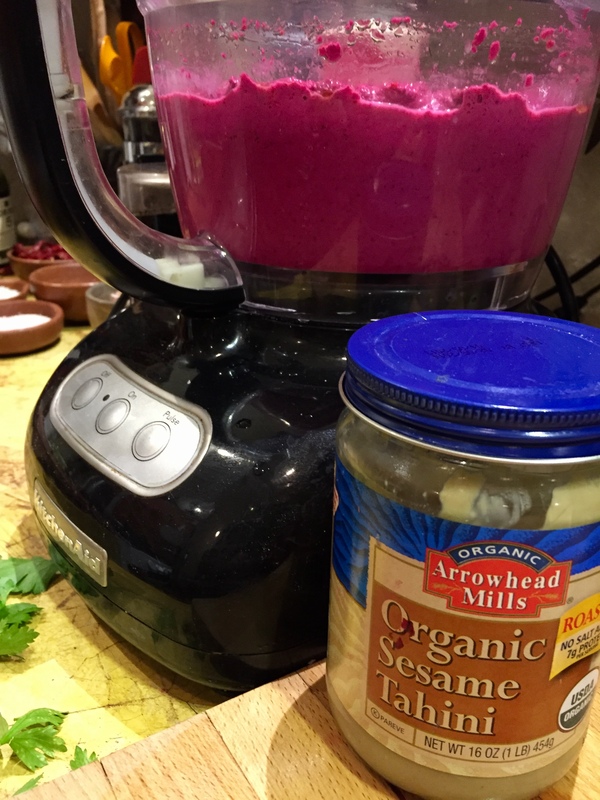 Use the “on” button to mix ingredients until butter is the size of small peas. With the machine running, add the ice water slowly through the pour spout of the lid until the flour begins to form a dough ball. Add more ice water if needed. Remove lid and test to see if the flour is combined enough to form a dough. If not, continue processing and adding a bit more water. The dough should not be sticky! Remove dough from machine. Put it in a mixing bowl, cover and let rest for 30-45 minutes before working it. At this point, you can refrigerate dough, covered with plastic wrap or freeze it until ready to use. 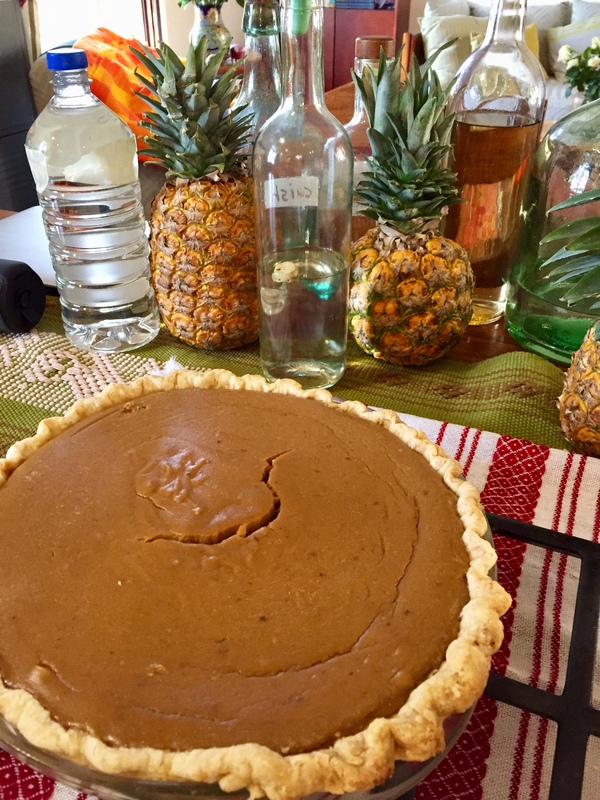 I will often roll out the crust, put it into the pie plate unfilled and then refrigerate or freeze until I need it. Put the dough between two sheets of wax paper. It should be soft enough after resting to work easily with a rolling-pin. Roll from center out to the edges, constantly turning the wax paper in 45 degree turns so that you create an even circle. When dough gets to 8-10′ in diameter, remove top piece of wax paper. Lift edge of bottom sheet of paper and flip onto your pie plate. Refrigerate for 30 minutes before filling. Preheat oven to 450 degrees. Put your rack in the middle of the oven. Remove crust from the fridge. Fill it. Don’t make the apples too deep. 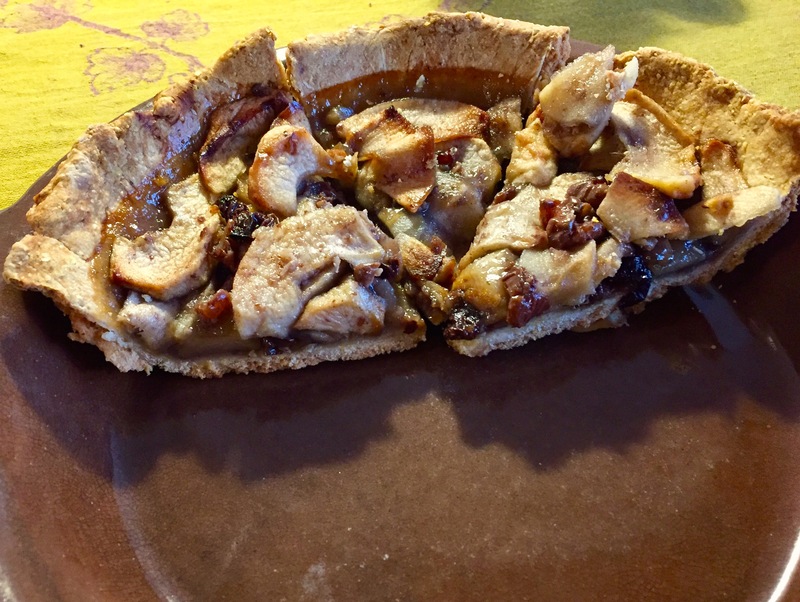 If you have enough filling and crust, you can make two 8″ pies. Reduce oven heat to 325 degrees and bake 30-40 minutes until the liquid congeals and becomes bubbly. Remove. Serve warm or room temperature. Top with vanilla ice cream if you like. 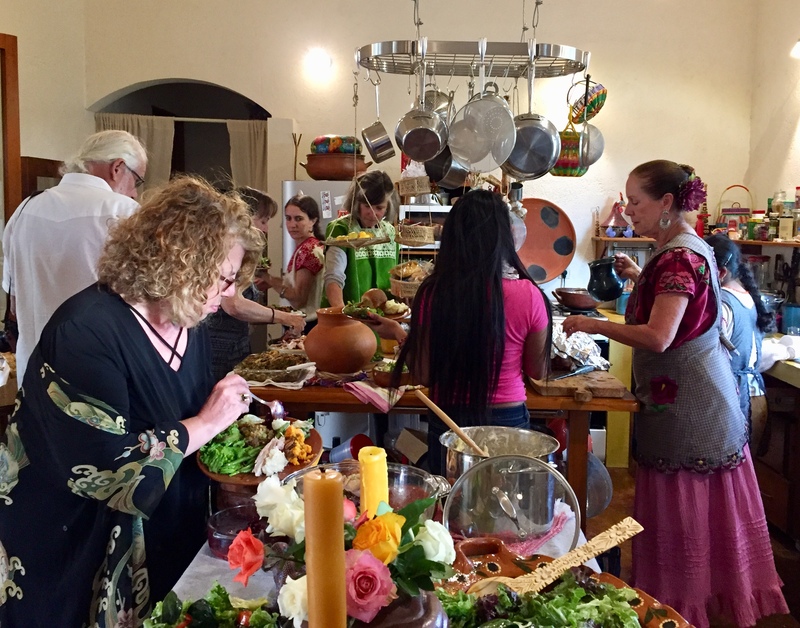 I’m returning to Mexico on November 16, and preparing Thanksgiving with Kalisa Wells for a crowd at my Teotitlan del Valle casita on November 23. I bet this will be among the dessert offerings! 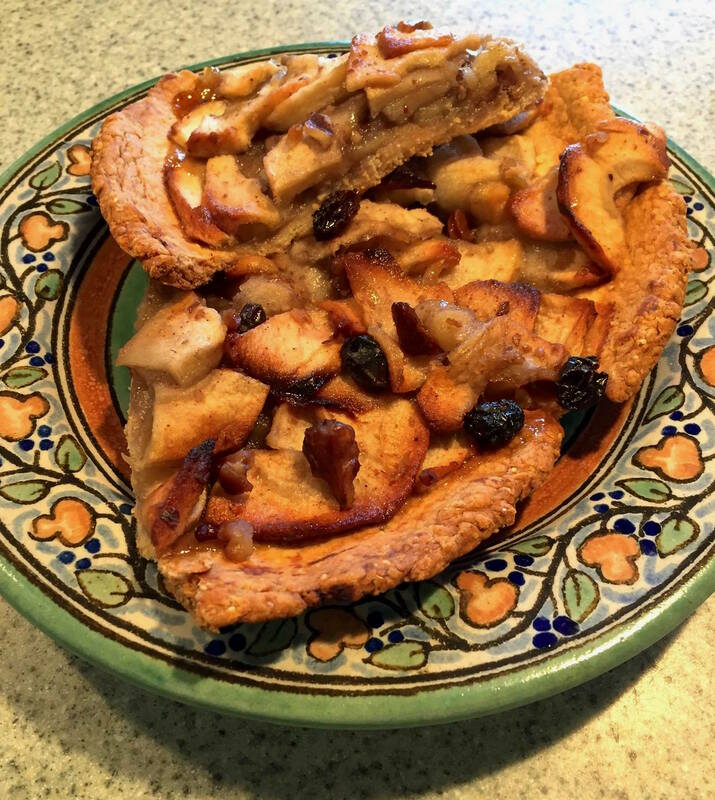 Pie on a plate. It’s also good smeared with cottage cheese on top.